People come here to find out all things mid-century, but I have a post to share that has nothing to do with mid-century. Well, maybe mid-century windows. You'll see what I mean in a minute. First, meet Splat. 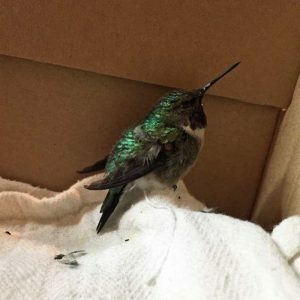 He's a ruby-throated hummingbird, and he was saved by our cat. I know that sounds amazing, but really! We were all going about our Sunday routine and I was stepping outside to check my plants for watering when our biggest (and sneakiest) cat (INDOOR cat) made a bolt for it out the front door. Luckily when he does this, he always heads for the neighbor's yard because apparently, their grass tastes much better than ours. Scooping up the cat, I was heading back to the front door, passing the front, raised planter bed underneath our son's bedroom window when something moving caught my eye. I tossed the cat unceremoniously into the house and headed back to check it out. Low and behold - a hummingbird. The hummingbird was hopping around in the mulch in the shade of some bushes and was not alarmed and made no attempt to fly away when approached. I knew something was amiss. I called to my oldest son who's window this was. He came out and explained that he did hear something bump the window, and I pointed to the hummingbird. Culprit found, and off to the internet we go, to see what, if anything we could do. Don't forget my good side! 1.) Find a box. Something with a lid, preferably. 2.) Place a towel in the bottom of the box. Do not use terry cloth as their little claws could get stuck in the loops. 3.) 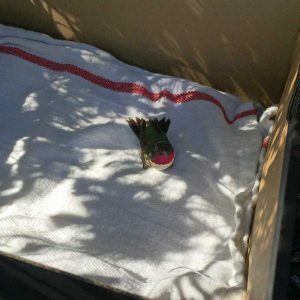 Take the bird to a rehabilitation center. Numbers one and two were easy to accomplish. 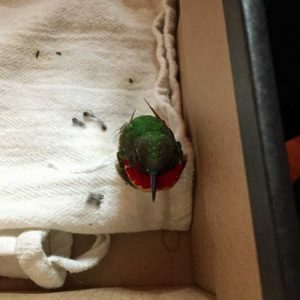 The youngest kid wears enormous shoes, so one of his shoe boxes would be more than enough space for our tiny hummingbird. The second was also easy - a kitchen tea towel was just the ticket for comfort. The third was slightly less easy to accomplish because it was, after all, a Sunday, and I also did not know a specific place to take the bird. Back to Google we went and low and behold, a wild bird rehabilitation center in our area! They did have a weekend drop-off box, but reading more about hummingbirds, I found that they need to eat frequently. Dropping him off at the sanctuary was not an option. I also needed to feed him. But how, and what to feed him? Splat took to the syringe like a champ! 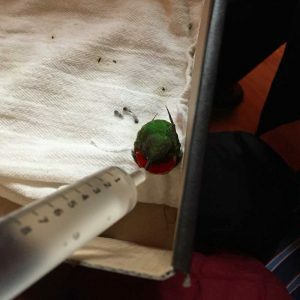 His narrow beak and long tongue were able to enter the end of the syringe and we could watch the volume of the nectar change and see air bubbles form in the nectar as the nectar was displaced. Splat wasn't Splat until this moment. We all decided that he needed a name, and my husband suggested the moniker true to the reason we had found him - a "splat" on the window. It seemed a little callous in the moment, but the name stuck. On a serious note, over one billion birds will die each year from strikes against windows. In the daytime, windows reflect foliage and birds believe that the reflection is something they can fly to, striking the windows. At night, bright lights emanating from windows may attract birds, causing them to strike windows. Decals of hawks or stickers on windows that are placed far apart will do nothing to lessen strikes. 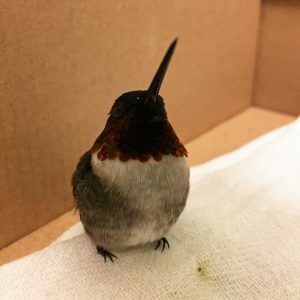 If you have a window that has been a frequent cause of bird strikes or any large picture windows, read this information from the Cornell Lab of Ornithology. We brought Splat back home for the evening. Knowing that hummingbirds need to eat frequently, I set my alarm for two-hour increments throughout the night to feed Splat. It may have been excessive, but I allowed him to decide when and how much nectar he needed and then left him alone again. I kept him warm by leaving his box on a heating pad turned to the lowest setting, and also kept him closed in our bathroom so that there were no curious cats. A bit of trivia for you; in the still of a house at 3 in the morning, you can actually hear a hummingbird drink. He and I both made it through the night. The next morning, a little groggy (me) and fat and happy (Splat) we set out for our drive to Wild Bird Rehabilitation. As much as Splat and I had bonded (especially in those wee hours of the morning) I knew that we could not keep him. Fact: It is illegal in the United States to be in possession of a hummingbird per the Convention on International Trade in Endangered Species of Wild Fauna and Flora, also known as the Washington Convention. Wild Bird Rehabilitation consists of a remarkable group of people, working only as volunteers and for whatever donations they receive. They kindly took Splat in and recorded all relevant information that I could give (when and where the bird strike happened, what means we had tried for rehabilitation, had he been fed and more). One special feature of the rehabilitation group is follow-up; after processing, I was given an email address and case number for Splat and was told that I could reach out in five weeks' time (the length of a standard wild bird rehabilitation) to find out what happened to Splat. Splat came in with brain disorientation and issues with feeding himself, but I am proud to say, that after 7 weeks rehabilitation, Splat made it and was re-released into the wild. Now I'm the one who's fat and happy.